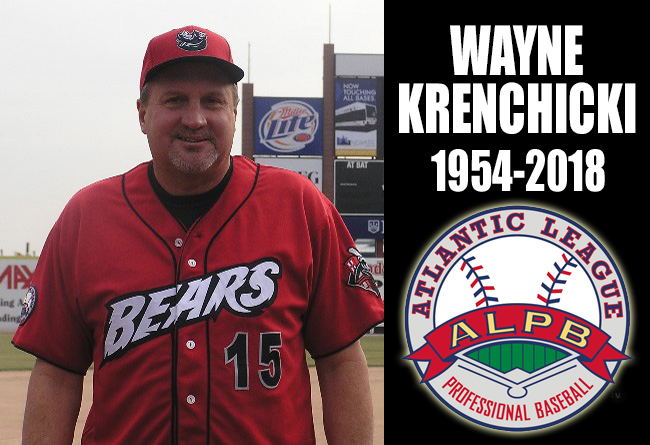 (Lancaster, Pa., Oct. 17, 2018) - The Atlantic League of Professional Baseball joins the baseball community in mourning the loss of Wayne Krenchicki, who passed away at the age of 64 on Tuesday. The former Major Leaguer managed in the Atlantic League from 1998 to 2008. He led the Newburgh/Lehigh Valley franchise in the early days of the league before becoming the manager of the Camden Riversharks from 2001 to 2006. Krenchicki guided the team to three straight playoff appearances from 2002 to 2004. He was honored by the league in 2002 as the Manager of the Year, leading the Riversharks to a 71-54 record. He was hired as the manager of the Newark Bears for the 2007 and 2008 seasons, winning the championship in 2007 with the franchise. For his Atlantic League career, Krenchicki posted a 704-689 record. Krenchicki had an eight-year Major League Baseball playing career with the Baltimore Orioles (1979-1981), the Cincinnati Reds (1982-1983, 1984-1985), the Detroit Tigers (1983), and the Montreal Expos (1986).